Not all litters have a runt and, if they do, there is usually only one. This holds true for both cats and dogs. The runt of the litter is the least nourished of the group and often the weakest. Runts are usually smaller and more prone to health issues that cause them to develop at a slower rate than their littermates. However, with some extra care and TLC the runt of the litter can grow up to be just as happy and healthy as his or her brothers and sisters! Female dogs have a Y-shaped uterus. The puppy that forms in the middle of the uterus at the start of the Y fork is the farthest from the mother’s blood supply which results in its getting the least nutrients. This causes it to develop more slowly leaving the runt thinner and smaller than the others. The pups farther from the middle are closer to the blood supply and thus have more access to nutrients in the mother’s blood causing them to be bigger and stronger. When the dogs are eventually born, the one that received the least nutrients is then considered the runt of the litter, usually noticed by their difference in size. Can a Litter Have More Than One Father? Over the three week period female dogs are fertile, they release multiple eggs and are capable of conceiving every time they mate. If this happens, one litter can have two different fathers. If the matings are farther apart than the three week period, the female dog can have two separate litters at the same time. 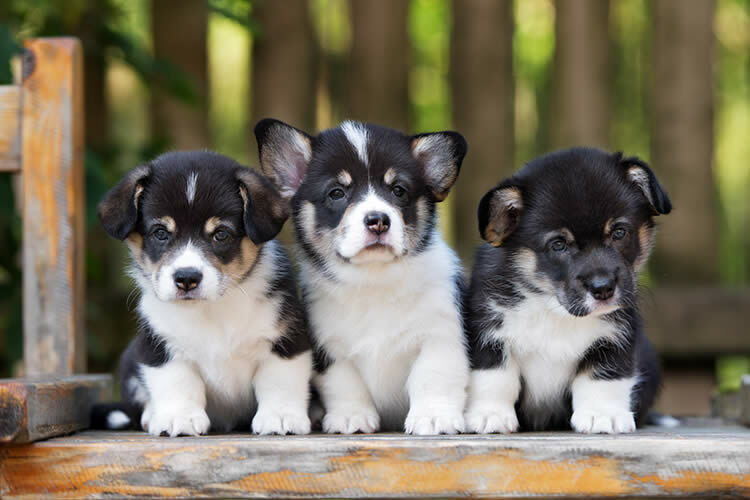 In these situations there may be a substantial size difference between the sets of pups as the pups who were conceived first are older and thus farther along developmentally. In these cases runts from these litters are actually just premature. What Is It Like to Be the Runt of the Litter? Runts may have a rough time at the beginning of their lives, but, if they are looked after carefully, they can grow up to be just like their littermates. The mother dog may reject the runt when she gives birth. Since the runt is smaller and weaker, the mother might not give it the same amount of attention as the other puppies. This survival strategy is a holdover from when dogs gave birth in the wild and runts rarely survived. Back then with so many mouths to feed and protect, it might not have been worth it for the mother to spend the energy needed to keep the runt healthy. Also, the other puppies may “bully” the runt by climbing over it to get their place in the dinner line and thus make it difficult for the runt to get its mother’s milk. In these survival of the fittest situations, runts usually lost out. Luckily, many dogs now a days give birth under different circumstances where there is much greater of a chance for the runt to survive and live a normal puppy life. Do Runts Act Differently From Their Littermates? Just because they are the runt does not mean they are the most submissive. Runts can be just as playful and stubborn as their brothers and sisters, and once they grow up can be just as healthy and energetic. I personally have had two runts as my family pets and loved them all the more for it. They were both a little quirky with wonderful and loving personalities. The Nest: Does Every Litter Have a Runt? Here Pup: What Is the Runt of a Litter? Cuteness.com: Why Is There a Runt of the Litter?